Depending on where you are traveling from, there are many awesome spa vacation destinations in the U.S., Canada, Caribbean, Europe and in the Pacific. One of our favorite rejuvenating getaways is Hawaii - the islands offer incredible wellness centers inspired by the natural beauty of the surroundings. Mauna Lani Resort on the Big Island of Hawaii is home to two great spas - the Spa at the Fairmont Orchid where you can get treatments surrounded by a waterfall and the Mauna Lani Spa with a unique rock sauna. Europe is home to many beautiful spas, including Italy, Spain, Portugal, Germany and Austria. If you have time to travel to Bora Bora and Tahiti, the wellness centers in French Polynesia offer beautiful views and unique treatments. Maldives offer a selection of beautiful resorts. 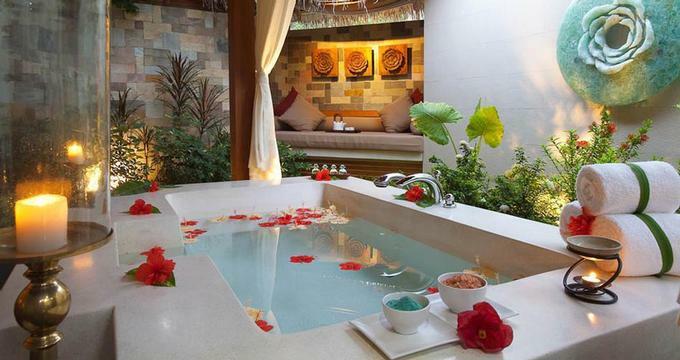 Try Baros Maldives or the underwater spa at Huvafen Fushi. There are many great spa resorts to choose from in the U.S. and abroad. When planning your trip, call the spa and make sure that it will be open while you are there and that there are no renovations planned. If there is an outdoor pool, make sure that it is still open for the season when you go. If you are traveling with kids, ask about spa policies - many spas will allow a teenager when accompanied by an adult. Many resorts offer specials to encourage travelers to try their services. If you are considering purchasing a package, make sure that it's flexible enough to allow you to get the treatments that you want. Sometimes a package will include a 50-minute massage so if you like to get 90 minute treatments that many not work for you. Packages can be a great way to save but if you don't use the treatment, it usually expires when you check out. A weekend spa trip can mean massages in your room at a hotel or a visit to a full service spa resort. People often overlook city spas which are a great way to relax without having to travel very far. Hotels often offer specials on weekends because there are fewer business travelers. Look for offers in New York City, San Francisco, Los Angeles, Chicago, Boston and other major cities. The Sagamore, located four hours from New York City, has a rejuvenating wellness center, offering traditional and special therapies. Patrons can choose from Shiatsu, Craniosacral Therapy, Reiki Energy Healing, Acupuncture and more. If you are looking for a getaway from Chicago, visit Grand Traverse Resort which has a great spa and fitness center. Couples who take trips together are on to something. It's easy to relax and reconnect together while enjoying massages, yoga, life improvement classes and healthy cuisine. Plan a romantic getway or a longer trip with your significant other. If you are an avid golfer, you can combine golf with a spa trip since many resorts now offer treatments that relax the body after golf. Or plan a wine tasting tour in Napa Valley or Sonoma where there are many romantic hotels and resorts with beautiful wellness centers. Caribbean islands offer many romantic spots, whether you are looking for a secluded hotel or a full-service resort. At La Samanna, guests are accommodated in luxury oceanfront villas and can choose from an array of healing treatments. Carlisle Bay Antigua, popular with honeymooners, has a beautiful 17,000-square foot rainforest wellness center. If you are looking for a getaway with many other activities and attractions, visit Atlantis Paradise Island Resort in the Bahamas, where you can lounge next to many pools, go snorkeling and play golf. Mandarin Oriental, Atlanta has a luxurious wellness center with an indoor pool, relaxation areas and stylish treatment rooms. The Brazilian Court Hotel in Palm Beach, Florida is home to the Frederic Fekkai Salon and Spa. While many resorts still do not allow kids to enter their spas, Kingsmill resort in Williamsburg, Virginia, has recognized the need to offer services to their teen guests. The spa at Kingsmill offers a menu of services designed especially for teens ages 12 to 16. Since a parent or guardian is required to remain there during all teen services, this can be a valuable bonding experience. The Westward Look in Tucson, Arizona offers accommodations with private outdoor hot tubs. The Stargazer Spa Rooms are ideal for anyone looking for a romantic escape. You can enjoy the chemical-free hot tubs under the stars in your own private courtyard. These unique accommodations also have king-sized beds, vaulted ceilings and large bathrooms. The Westward Look Resort has also added a suite-sized version of these rooms which are outfitted for coed massage and dinning on the terrace, as well as the outdoor hot tubs. More Arizona spa resorts. Coeur d'Alene in Idaho makes it easy to experience healing properties of water with one of their hydrotherapy baths. Each bath takes about 45 minutes and costs $80. Thermal Mineral Bath contains large quantities of minerals and is ideal for detoxification, relaxation and muscular fatigue. Thalassobath, designed to stimulate blood circulation, contains dried seaweed and Oligo Sea Water crystals. Aromatherapy Mineral Bath employs essential oils to soothe and invigorate. Krauter Bath, which means herbal bath in German, is made from rich botanicals including Wildflower, Melissa, Pine and Chamomile. At a quick glance at the hotel spa industry, any active vacationer will realize that it appears that golf destinations always seem to have great spas. Scuba diving, however, is not always associated with luxury pampering. After all, you are there to see the fish, right? Lizard Island is the place to go if you want a private island with great diving, breathtaking views, and long uncrowded sandy beaches. After a long dive at any of the numerous dive sites nearby, return to Lizard Island and the Azure Spa. Try the Mermaid's Secret body treatment. A gentle Jojoba body polish, followed by a nourishing full body mask, and finished with a scalp massage while you are wrapped in the body mask. Sixty minutes of pampering on a private island resort is enough to relax anyone. Any golfer will tell you that golf is a great sport and that their biggest problem is not being able to play enough. As an individual sport, however, a round of golf can take over four hours, even five if its really slow going. We have seen so many people squeezing in two rounds per day for their entire trip. Don't forget that one of the main benefits of a vacation is returning to your job relaxed, stress free, and ready to tackle new challenges. If you are a golf fanatic then try the Barton Creek Resort. There are four golf courses which are considered to be among the best in Texas, if not the nation. You could go for a quick getaway and play a different course each day. In order to be sure that you return home relaxed and with as little back trauma as possible, try the Spa at Barton Creek. If you are in need of some serious treatment and can tear yourself away from the great golf, the spa offers a Spa Luxury day. That's five and a half hours of exfoliation treatment, massage, essential oil envelopment, European facial, manicure, pedicure, shampoo, style and lunch. If you don't have the time and are more concerned with fixing your dramatic slice, than try the Stress-Relief Half Day for $290. While you may not break any course records, you will be so relaxed you won't care.